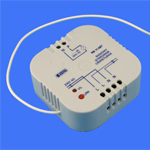 The use of wired controllers is reasonable in new or modernized buildings. But, in case new cabling cannot be provided, remote control using IR or RF transmission may be installed. One wireless controller may be served by many remote control terminals and one terminal may also control a roller blind group. 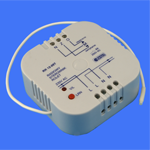 Wireless control units for lighting on/off are also available. In case of larger number of roller blinds and/or light points the use of one multi-push-button terminal for remote control of all items is convenient.